Sometimes the simple can be the most profound. 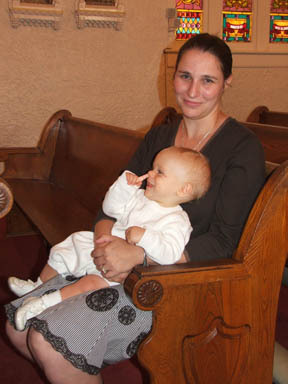 My husband and I made first Confession on Saturday. During Sunday Mass at a beautiful little church in Kentucky, we were baptized (Justin and I conditionally) and then we and the oldest boy received Confirmation and Holy Communion. Justin took the names of St. Justin Martyr and St. Joseph; I chose St. Gianna; The Oldest, Sts. George and Benedict; the girls chose St. Joan and St. Elizabeth of Hungary; and the youngest, St. Peter. 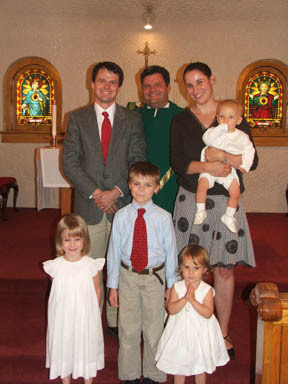 Our sponsors and the children's godparents are a couple that entered the Church about 12 years ago from the same background out of which we came. families with lots of children. It felt strange to wake up Monday morning and say, "We're Catholic." We never thought that would happen. It was a wonderful experience, in the true sense of the word, and we will be mulling over the significance of it for a long, long time. The two year old is looking uncharacteristically pious. An attitude more characteristic of some members of the family. Jordana, I didn't get to say this on the other post, since the comments were closed, but congratulations! I know it probably was a hard road, but I'm glad you've found a home in the Catholic church. Sorry, had to get that one out of the way first. I'm immensely curious about your decision and this particular path. I'd say it's pretty unusual for Jews to switch varieties; they tend to either lose organized religion entirely, or embrace it entirely. I guess I've heard of Conservative Jews moving to Orthodoxy, but rarely the other way. Again, it's more likely that they abandon full-time practice altogether. Someday when you're up to it, I'd love to hear what made you take this route. In the meantime, enjoy the Inquisition and let us know if you get any cool welcoming tchotchkes from Opus Dei. Jordana - Congratulations to you and your family. I am truly happy for you. As it happens, I start my swim across the Tiber with my first RCIA class this evening. I ought to see you on the other side at Easter. Congratulations! May your new road be filled with the blessings from a closer walk with God. You guys look grand. What a wonderful day! I was in Branson two days ago and took a walk and happened by a Catholic church. I walked towards the front of the church and stood in front of Mary. Her hands were out welcoming me. As I stood there in prayer I felt myself being hugged, a feminine touch for sure, that I saw in my minds eye and sensed it to be like the prodigal in Rembrandts The Prodigal Son. In other words I sensed her hands were on my back and my head rested on her stomach. God is wild and real. It sounds weird to me to hear you say it too! :-) Congratulations. You all look beautiful. Congratulations! This sounds like a wonderful fit for your family. I, too, would love to hear more of your musings on converting, Catholic theology and how you and it relate to each other; anything you'd like to share. Sometimes I feel like, for me, converting to Catholicism would be like coming home; other times, I'm not so sure. Sorry I'm late with this, but, congratulations!!!! Congratulations on your acceptance of Catholicism! You totally need to get your hands on a copy of the book The Church Visible:The Ceremonial Life and Protocol of the Roman Catholic Church by James-Charles Noonan. I hope all is well in Nashville.